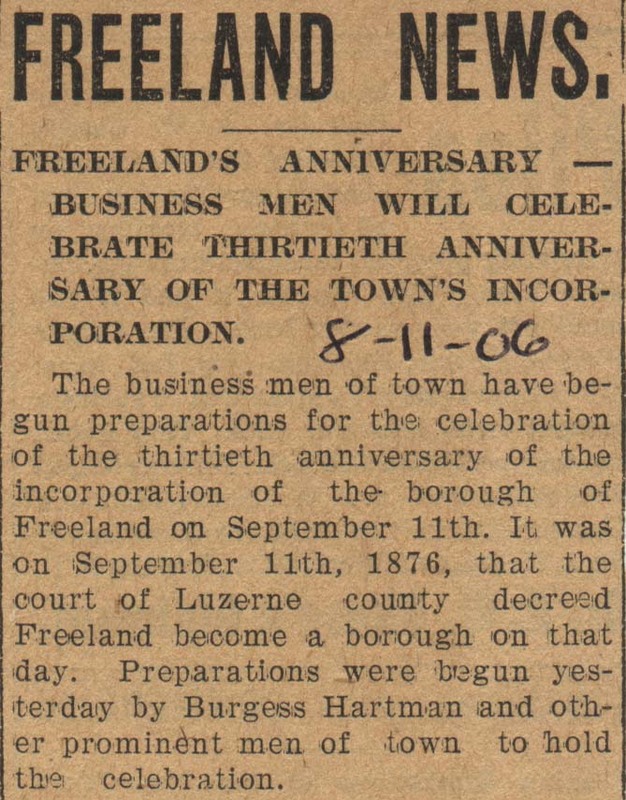 Our town was initially called Freehold. 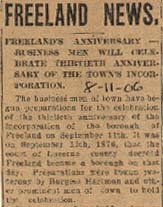 A few years after its founding, the town was renamed Freeland and was incorporated as a borough on September 11, 1876. 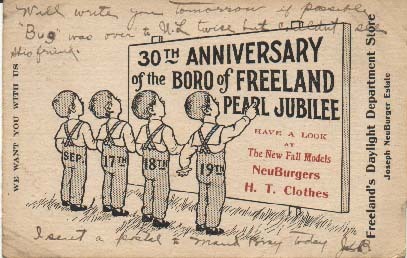 Thirty years later, the citizens of Freeland held a huge celebration, the Pearl Jubilee, to commemorate the incorporation. 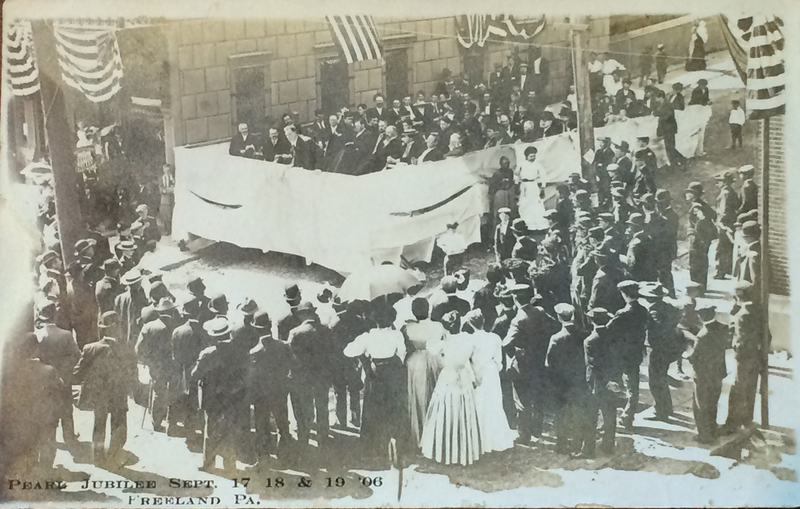 The clipping shown at left is apparently from one of the Hazleton newspapers. 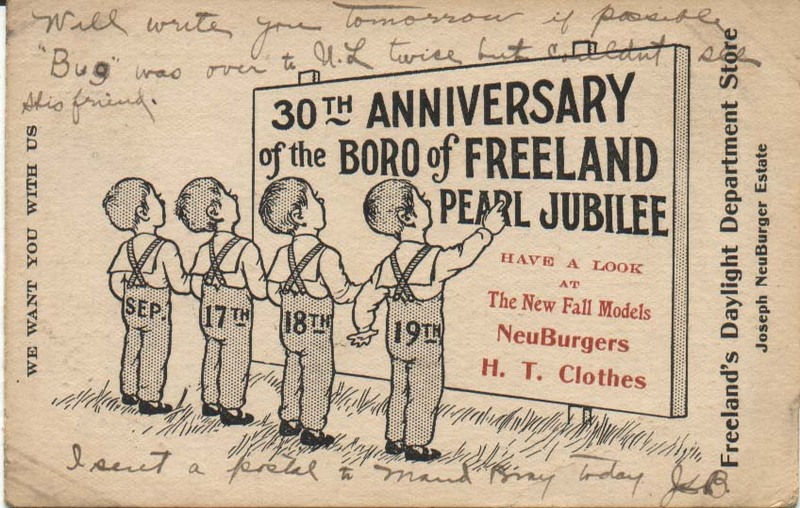 Written on the clipping in pen is the date "8-11-06", a month before the borough's 30th anniversary. 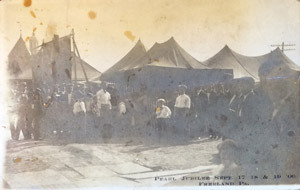 The preparations were elaborate and the festivities lasted for several days. This is an amazing picture. Look at the contrasts between the rough electricity poles and the lampposts, between the elegantly draped buildings and the unpaved streets. There are lights arching over the street, not unlike the Christmas lights that have graced our streets in later times. It's wonderful to have this view, and then to see the next two photos showing the parade and all of the excited townspeople lining the streets to see it. This photograph was apparently taken from an upstairs window. 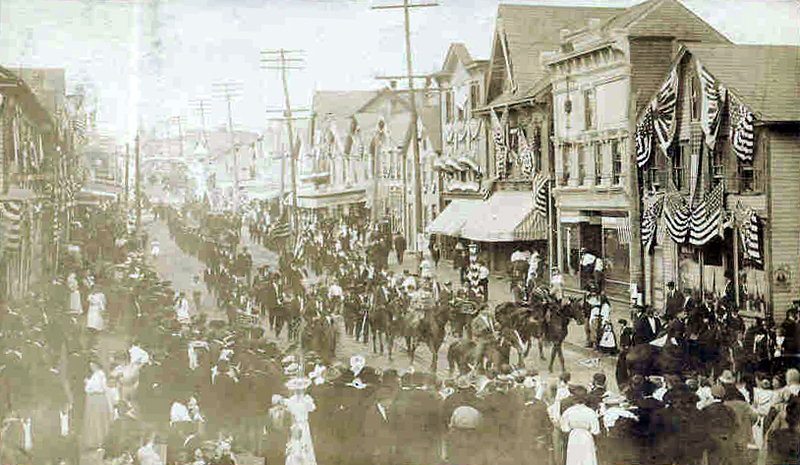 The view shows onlookers dressed in their best clothes for the occasion, and a number of horsedrawn carriages containing prominent citizens. This may be the most decorated that Freeland has ever been at any time before or since. Here is another parade view that provides a sense of scale, showing the width of the street, the size of the buildings, the parade participants in action, and the crowd watching the parade. At a time when there were no electronic diversions, an event such as this was exciting for people of all ages, backgrounds and economic classes. 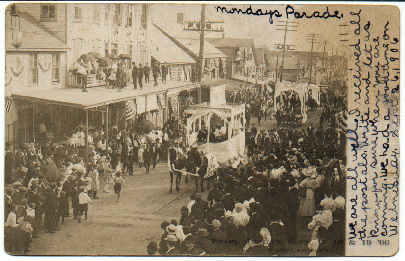 The number of people watching one of the parades was estimated in the local newspaper as exceeding 15,000. 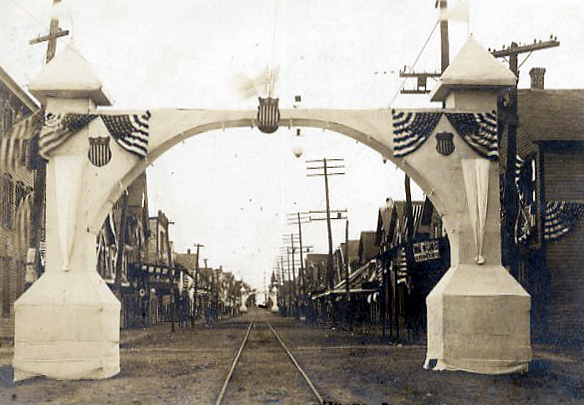 Ceremonial arches were constructed at the corners of Centre and Carbon streets and Centre and South streets. 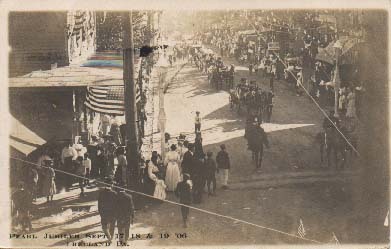 This postcard gives a great view up Centre street from just below Carbon street, without the parade participants in the street and the admiring crowds on the sidewalks. 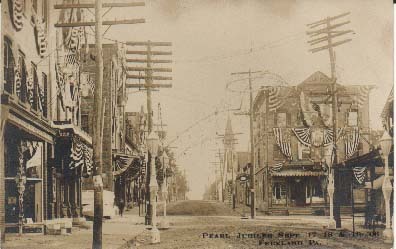 You can see the extent to which all of the buildings on Centre street were decorated with bunting, flags, and other types of decorations. Note the trolley tracks running up the middle of the street. 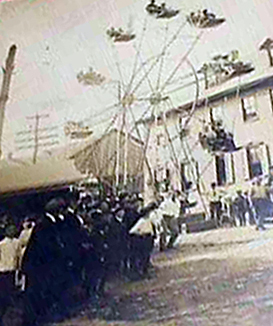 In addition to the music, marching, speeches and other aspects of the celebration, a carnival was brought to town. This view of the ferris wheel that was set up at the Jubilee is not very clear or straight and I apologize for that, but it's all I have and I thought it interesting enough to include here despite its poor quality. 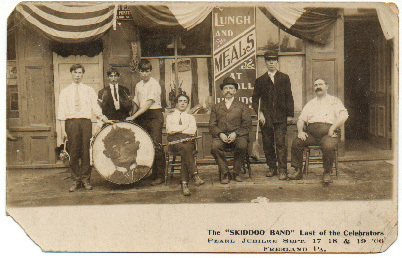 The ride was set up on South street and by all accounts was a novelty for Freeland and very popular. 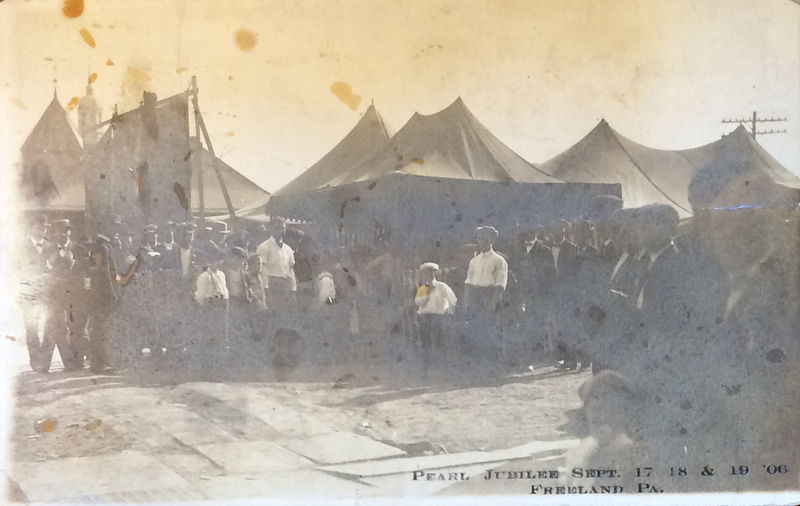 There were also a merry-go-round and various vaudeville shows available as street attractions. Mr. Nick Deitos brought these three postcards to MMI one night when I was giving a slide talk there and he allowed me to photograph them. 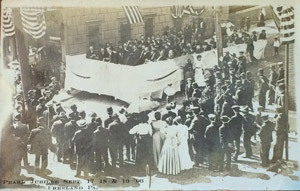 The one at far left shows the "dignitaries' stand" at Front and Centre streets, alongside DePierro's, now the location of the bank. 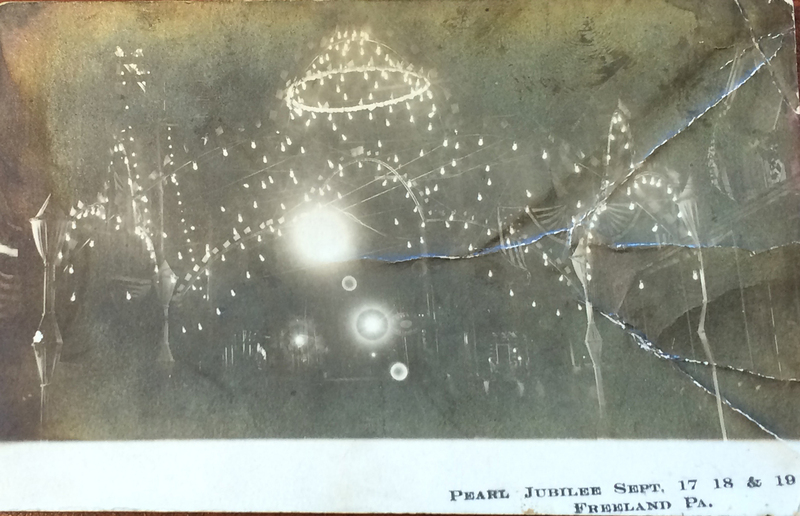 The middle photo shows a night view of the lights that were strung across the streets. 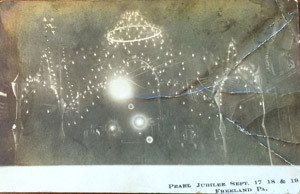 The right-hand view shows a group of tents, but the postcard is damaged enough that it's hard to tell what they were for. Thanks to Mr. Deitos for sharing these rare images with us. Charlie Gallagher had an interesting comment about the tents: I can't say what the tents were for. But they were north of the railroad station (between the station and Bereznak's. You can see the station turret to the left, as well as the MMI cupola behind it. Perhaps vendors (food, games of chance, souvenirs) for the visitors arriving by rail? 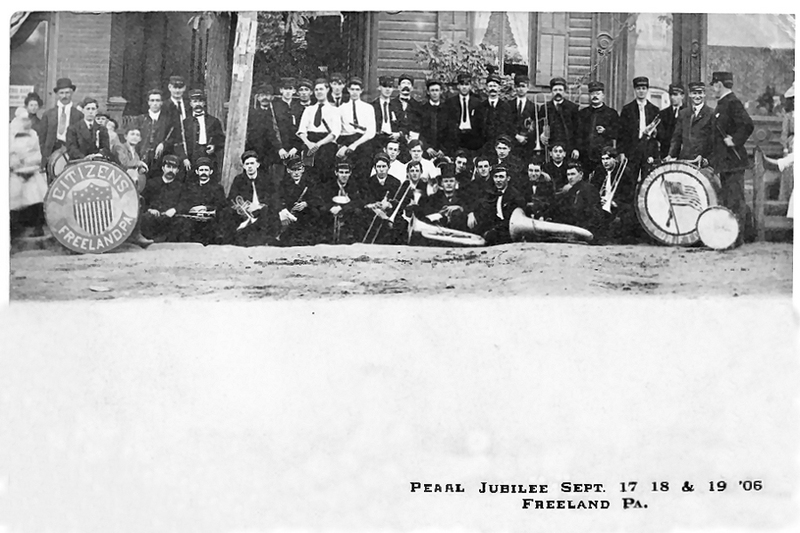 PEARL JUBILEE BOOKLET - In August 2006 I produced a small booklet to commemorate the 1906 Pearl Jubilee that was held on the occasion of Freeland's 30th anniversary. The booklet is a small, home-made production of 16 pages, photocopied at Kinko's with a cardstock cover. 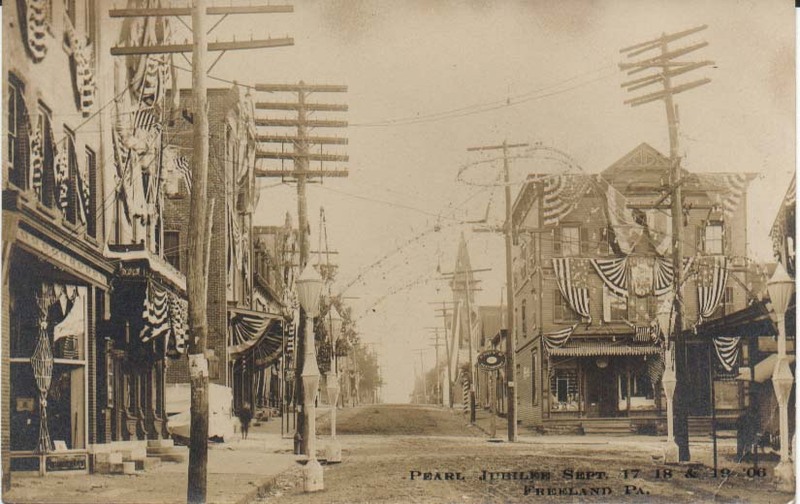 Much of the text is excerpted from The Freeland Tribune of August and September of 1906, to which I've added background information about how much Freeland had grown between the time of its founding as Freehold in 1873 and the Pearl Jubiliee in 1906. It's really interesting to read the newspaper coverage of the way that this large-scale celebration was put together and realized on what seems like an extremely short lead time, especially given the state of communications and commercial distribution mechanisms at the time. Also somewhat mind-boggling are the numbers of people that reportedly attended the celebration, which lasted over several days and nights and included many events, open houses, and types of entertainment.